There are only a few more weeks of school left. Last week, we attended Big Onechan’s (“Nene” or Bebe E’s big sis) high school swim banquet, marking the end of the season and the approach of summer. The girl’s swim program at Nene’s school is small (there are more boys than girls that swim), so at the beginning of the season some of the freshmen were moved to junior varsity or varsity. When she announced to us that she was one of the few freshmen selected to swim on varsity, we were quite proud of her. Granted, many of the varsity seniors that she competed against were bigger, stronger and faster, she embraced this opportunity with a very good attitude and set personal goals for herself to improve her times. One of her goals was to swim the 50-meter freestyle under 29 seconds. If you’ve ever swam laps in the pool for exercise, you can probably imagine that you’ll need to kick pretty hard and swim pretty fast in order to do 50-meters in under 29 seconds. At the banquet, we had one more reason to be proud of Nene as she was presented with her “letter” as she managed to meet her goal of swimming the 50-under-29 seconds. We’re quite proud of her. Even Bebe E squealed with excitement as Nene’s name was called at the banquet and she walked-up to receive her certificate and “letter”. “There’s my Nene! That’s MY Nene!” shouted Bebe E. Congratulations, Nene! One of Nene’s favorite foods is fish sticks, and something my husband used to make for her regularly, until I banned most of his store-bought frozen foods. I never grew up eating fish sticks, let alone frozen fish sticks. My parents cooked a lot of fresh salmon and a variety of white fish, but this was typically cooked in the oven, on the grill, or on the stove. The closest thing to fish sticks that I ate growing up was probably my Mom’s small tempura fish bites that we ate with ketchup. My Mom never grew up with fish sticks in Japan and this is likely why she never served them to us, nor bought frozen fish sticks. This likely also explains why I never liked eating the frozen fish sticks that my husband made for us when he first starting cooking at home for me. Over the past two years I’ve been incorporating more fish into our diet and I’ve been looking for more creative ways to serve it. Fortunately, I caught an episode of Giada at Home on my favorite Food Network where she made baked parmesan salmon fish sticks for a kid-friendly snack. I decided to turn these into a meal, but I omitted the parmesan because my husband isn’t a huge fan of cheese. They turned out quite well. Nene enjoyed these with ketchup and the rest of us enjoyed them with the dipping sauce recipe provided by Giada. 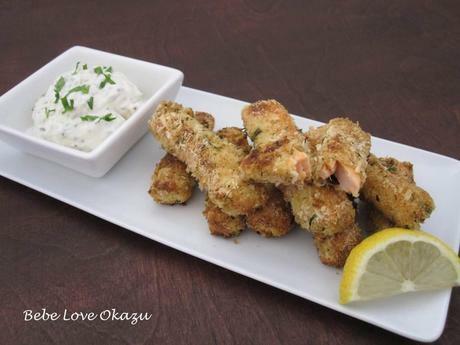 These salmon fish sticks are a great addition to our dinner repertoire and very kid-friendly. Even Nene, who doesn’t like fish other than the steamed fish her grandmother makes or the frozen fish sticks that come out of the box, ate these without any complaints. I loved that these are baked, not fried, and these are quite crunchy right out of the oven. This recipe is a keeper. I hope you’ll enjoy these as much as we did, especially the dipping sauce! I want to mention that over the weekend I finally started my website beautification project, thanks to the help of friends (thank you, M & M). I have a lot to learn and what seems like a long way to go before my little project is complete and I have my brand-spanking-new website, but I’m excited to finally have the wheels moving. Stay tuned! Cut the fish into 1/2-inch wide pieces x 2-inches tall. In a bowl, combine flour, salt and pepper. In a separate bowl whisk egg whites 30 seconds until frothy. In a third bowl, combine parmesan (optional) and bread crumbs. Coat the salmon pieces in the seasoned flour and shake to remove excess flour. Next dip in egg whites, and then finally into the bread crumbs. Gently press bread crumbs into the fish. Place the breaded salmon pieces on a liberally oiled baking sheet. Drizzle lightly with the olive oil. Bake for 15 to 20 minutes until golden brown. Make the dipping sauce. Mix the mayonnaise, yogurt, Dijon mustard, and parsley (or chives, if using) in a small dipping bowl. 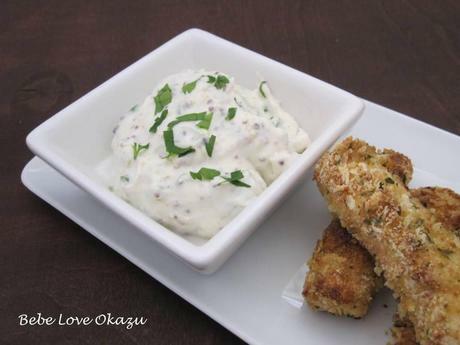 Serve salmon fish sticks with the dipping sauce. Recipe compliments of Giada DeLaurentis.